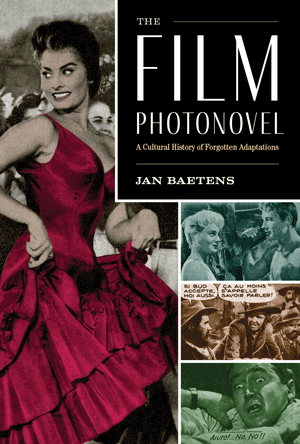 Jan Baetens' book The Film Photonovel: A Cultural History of Forgotten Adaptations is the first study devoted to the hybrid genre of the film photonovel. Baetens applies a comparative textual media framework to a previously overlooked aspect of the history of film and literary adaptation. Discarded by archivists and disregarded by scholars despite its cultural impact on post–World War II Europe, the film photonovel represents a unique crossroads. This hybrid medium presented popular films in a magazine format that joined film stills or set pictures with captions and dialogue balloons to re-create a cinematic story, producing a tremendously popular blend of cinema and text that supported more than two dozen weekly or monthly publications. Watch the author speak about his work in the book trailer video below, and dig deeper into his personal collection of this forgotten medium in this Q&A. Could you give us the elevator pitch of your book? I have worked largely in the field of adaptation studies as applied to cinema, and I have always defended the idea that film is both a screen- and a print-based medium. Film circulates via all kind of printed formats and related products, and historically speaking, the film photonovel was probably the most intriguing of these print adaptations—most intriguing but, paradoxically, also the most forgotten, for the film photonovel, which was immensely popular in the late 1950s, has fallen into complete oblivion, mainly though the lack of any archive (film photonovels were not kept in university libraries, and the private archives have nearly all disappeared). My book I draws on research based on my private collection of film photonovel magazines—I currently have some 1,400 items—and aims at reconstructing the history of the film photonovel not just as a particular genre, but also as a social medium, that is, a social practice and everything that accompanies it. By doing so, I try to rewrite the history of cinema itself, for the film photonovel is a wonderful tool for showing how films were received and appropriated by popular audiences. How do you define the film photonovel? The photonovel is essentially a form of graphic narrative in magazine format, one very popular in pretelevision Europe, that combines sequentially organized photographs, generally six per page, and speech balloons as well as captions to tell a story—a romance in the case of the photonovel and the story line of a film in the case of the film photonovel. Film photonovels are thus a special type of novelization, a type that relies on two major features, both inspired by the photonovel model: first, the priority given to images (at the expense of the text); second, the attempt to reframe all adapted movies, whatever their genre or specific tone, as melodramas, the typical genre of the photonovel. The result is often stunning, for even if a film photonovel does not present “new” images, the selection and layout, the narrative reframing of the stories, and the invented narrative voice in the captions all serve to re-create the adapted movie in surprising and visually very attractive ways. Why was the photonovel deemed “lowbrow”? Four elements play a key role in the film photonovel’s cultural disrepute: first, the influence of its model, the photonovel, which was discarded as a kind of silly romance comics with pictures; second, the fact that film photonovels were published only in magazine format, never in book form; third, the association with the world of tearjerkers—in the woman-unfriendly 1950s, certainly not the best way to acquire cultural capital; fourth, the belief that film photonovels adapted only commercial movies, never art-house movies. The rebuilding of the film photonovel archive, however, allows for a completely different reading of the material and the cultural biases that have tended to blind us to its very existence. Today we know that photonovels have a very wide range, that film photonovels sometimes exceed the limits of ephemeral magazine publication, that gendered readings have to be corrected, and that art-house cinema is as well represented in the corpus as is any other type of cinema. How does your research push the boundaries of adaptation studies? First, my research discloses a form of adaptation that has been completely ignored, lacking not only prestige but also visibility: no archives, no direct or indirect references, no visual traces. The progressive rediscovery of this material generates a kind of Pompeii experience, for things whose very existence had been ignored suddenly become visible. Moreover, we can now better understand the film photonovel’s importance as a social phenomenon: along with going to the movies (and sometimes instead of doing so! ), people read film photonovels, and their ideas on cinema were strongly influenced by their reading. Second, the film photonovel is also an important case in the debate on film adaptation. Adaptation is often seen as a one-way street, going only from book to film. Here and in my previous book on novelization, which has also contributed to this paradigm shift, we can see that this is just half the story and that adaptation does not stop once a book has been turned into a movie. Movies are ceaselessly remade in print format, and the film photonovel is without any doubt the most challenging form of these adaptations (which may also include comics, novels, posters, the “making of” books, games, etc.). At first sight, film photonovels may appear to be the poorest versions of these adaptations, since they cannot produce new images. At second sight, however, the obligation to rely exclusively on existing pictures forces the genre to be extremely inventive, as the many examples and images in the book clearly show. How did photonovels cross borders and affect audiences in Latin America? The production of film photonovels started in Italy around 1955 and then moved to France, nut it had also some extensions in other countries, including United Kingdom and, somewhat later, United States. In Latin America, where the photonovel was as popular as in Europe (and where, in certain countries, the medium still thrives), the European models were adapted for and appropriated by local audiences. The publishing world in Argentina was crucial in this regard: many Spanish publishing houses were active there (several companies were created by publishers who had to leave Spain during or after the Spanish Civil War), and European magazines circulated in Argentina as well (even French ones, Argentina being a very Francophile country). Some magazines, such as Secretos. Amiga y confidente de la mujer, published their own film photonovel serializations of European movies, while others, such as Superaventuras, specialized in American blockbusters. All these works were locally produced, in agreement with local distributors, as used to be the case in the film photonovel business in general.